Teotitlán del Valle hosts its third annual Fiesta del Maíz (Corn Party) December 12-13. Celebrating more than 7,000 years of culture and history in Oaxaca’s Central Valleys, the event pays tribute to the mainstay of agricultural sustainability in Mesoamerica – corn. It’s a grassroots campaign that is educational, not to mention delicious fun. Event organizer Zeferino Mendoza says the two-day party includes something for everyone — lectures, parades, tastings and a market showcasing various corn products. The Fiesta began in 2006 as an innovative event to engage visitors and locals during a time of social unrest and uncertainty. The turn-out grows each year. 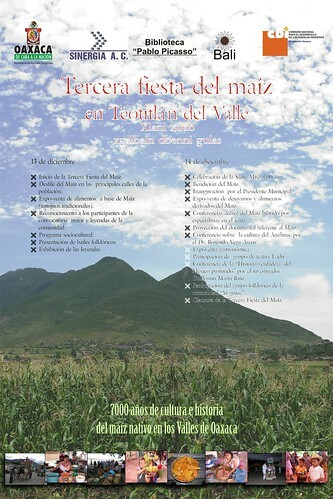 My source in Oaxaca sets the dates for the Corn Festival as Saturday, Dec. 13th and Sunday, Dec. 14th. Not the 12th and 13th. Keep up the great work on your site. Gracias!